DM INDUSTRIAL ANDS TRADING COMPANY is established in 2004 as a professional manufacturer of multi-functional flashlight and provide the OEM service to worldwide. Its new flashlight become more and more popular all over the world. our key specifications of flashlights are its multi-function and self-generator. This flashlight have dynamo that can charged by the hand wind without using pubic electronic and Dry batteries or chared by the solar energy. this flashlight is enviromental friendly and energy-saving goods , you never have worry about dead batteries or battery leakage. Regarding to the mulit-function, they have AM/FM radio, Audio-optic alarm, mobile phone charge for Nokia, ABS case with power Led light,waterproof and so on, if you need more function, we will add that in the flashlight for you.you can bring them when you are in camping, travelling, by velhical and other emergency situation. In this crank dynamo flashlight field, our factory devotes to find new ways of doing thing from the old theories and make new mould opened for a lot of new and fashion items , The creative design,efficient process, well organizzed & strict controlled QC, competitve price of flashlight have earned countless praise worldwides. Furthermore, our after-cales service ensures our customers estimated a worldwide reputation. 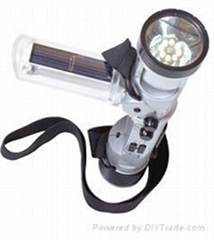 at present, our flashlights are good seller in Euro and America,South-east Asia. 3rd Floor,No.2 Building Dianqian Industrial Area, Huli District, Xiamen City,Fujian Province,CHINA.